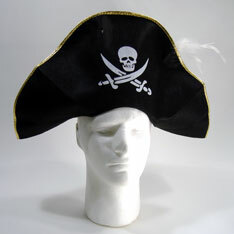 Fashionable and formal pirate evening attire is topped off by this little number and finished with a feather. Stunning. 10 inch crown. 15 inches wide. Made from composite fabric. Sold each. $2.80 each for 48 or more. $2.40 each for 96 or more.